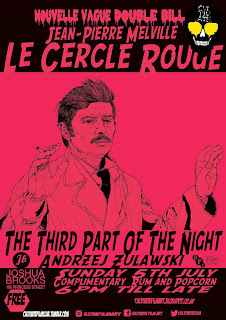 This week we go to France and Poland with two underground cult classics first up is Andrzej Zulawski’s THE THIRD PART OF THE NIGHT, this multi-award winning film has become known as a surreal masterpiece due to its multilayered symbolism and its apocalyptic use of imagery to portray the extremes of the human condition. Followed by Jean-Pierre Melville’s LE CERCLE ROUGE seen as one of the best heist movies ever made the style and the feel of this film has been replicated the world over but never matched Melville is the master of the heist genre who’s style and effortless cool has never been equalled. Two film fan classics with the usual free popcorn and rum.